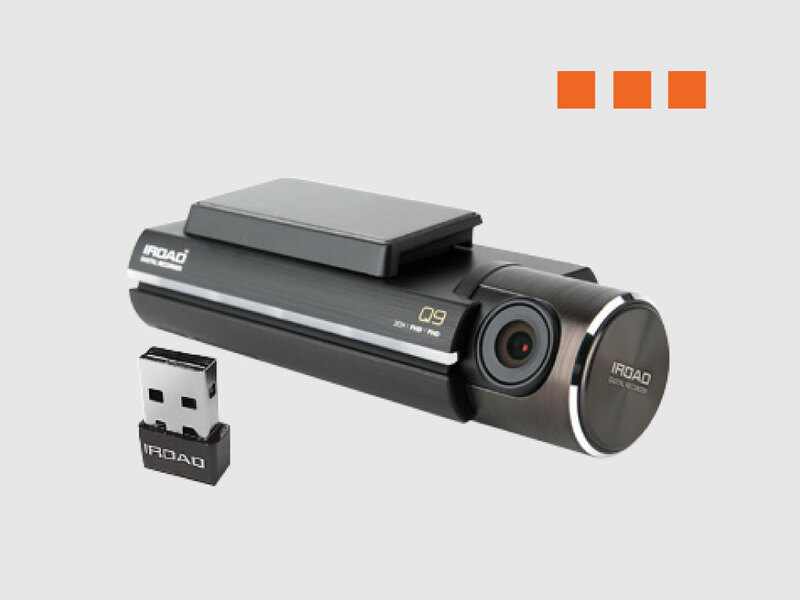 Reliable 2 channel front and rear drive recorder system for motorists who wish to record driving scenes from both the front and rear windows at the same time. 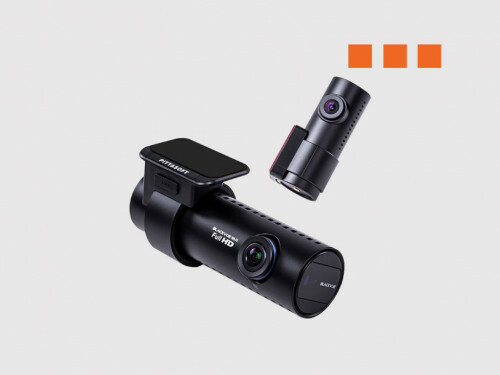 Both cameras offer ultra-high definition Full HD video recording with a 142 degree wide viewing angle. Full HD 1920 x 1080p Front and Rear cameras with 2.0 Mega Pixel Image Sensor. Maintains excellent colour in any situation. Night Vision includes new ISP (Image Signal Processing) technology and real-time image processing function to brighten images and improve overall night recording performance. 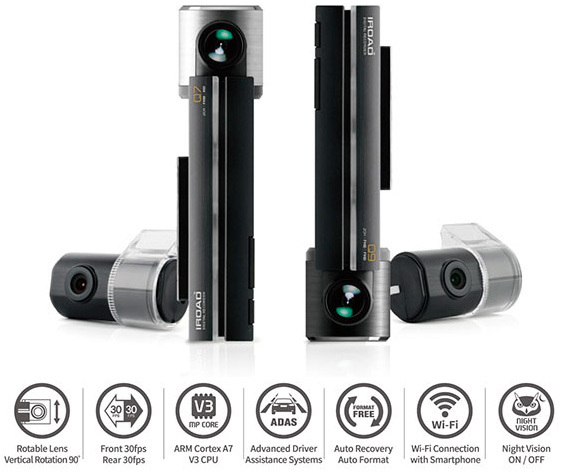 Built-in Wi-Fi enables the user to view Front/Rear live camera footage from their smartphone, change settings and make other changes to the system. Wi-Fi is automatically connected after running the IROAD smartphone application, and regularly checks whether the system is updated with the latest firmware version. 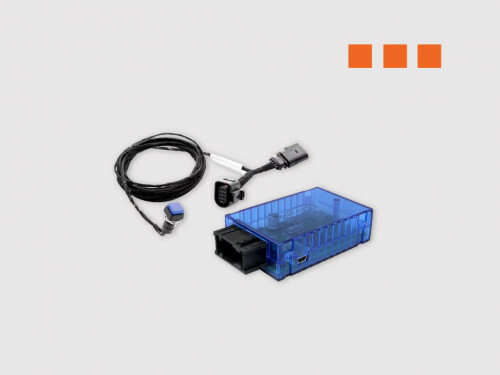 Dedicated PC viewer allows front and rear video playback which displays date/time, voltage, GPS and travelling speed information on the bottom of the screen. 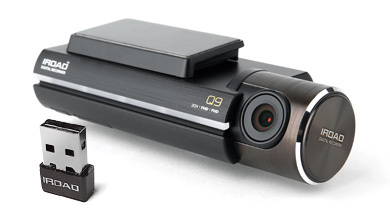 Also includes video zoom, night recording calibration and various other system settings. Normal: When the car engine is started, the device is automatically switched on and starts recording in driving mode. Event: During parking or driving, when motion is detected within the vehicle it will automatically start event recording. Parking: The system detects motion and impact around the vehicle when the vehicle ignition /power is off, and will automatically start recording for the period of time set by the user. The system will notify the driver when they return to the vehicle that an event has been recorded while in parking mode. Sharp daytime images as well as excellent low light night images. 30 frames per second recording ensures licence plates and surroundings can be detected more easily at a higher speed. 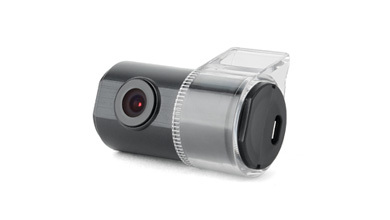 Sleek, minimalist and aluminium camera rotatable lens design. Format free smart storage system which means deleting and reformatting of the SD card is not necessary. High quality microphone is embedded in the device to record all audio which can be switched off in settings. Voice guidance is integrated for convenience. Notifications will alert the driver when event’s occur, recording start/stop, entering parking mode, ADAS notifications etc.. Easily removable, durable cradle is designed to be transparent and blend well with the interior of the vehicle. 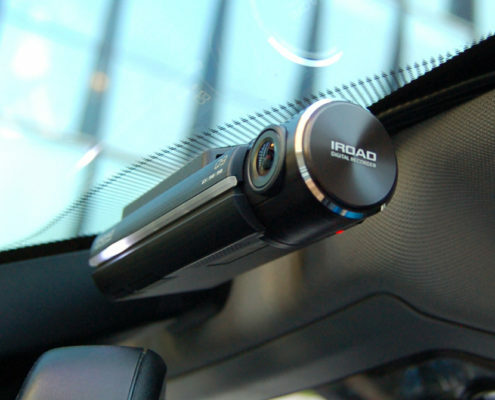 Rear camera includes a rotatable cradle ensuring the user can capture any desired angle. Automatic recovery function ensures damaged or mistakenly deleted files can be automatically recovered when the SD memory card is re-inserted into the camera. Recordings are saved in JDR video format and can be played via the PC dedicated viewer and Smartphone app. 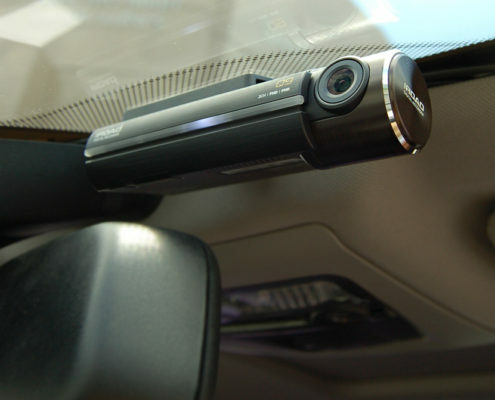 Front & rear security LED can protect your car from being damaged by others as it will appear to them the camera is in recording mode. The Q9 detects road markings and gives voice warnings to the drivers if the vehicle begins to stray from its lane or when it is at risk of an imminent crash. Front Vehicle Departure Warning is for generating a warning when the vehicle ahead departs from a stationary position. 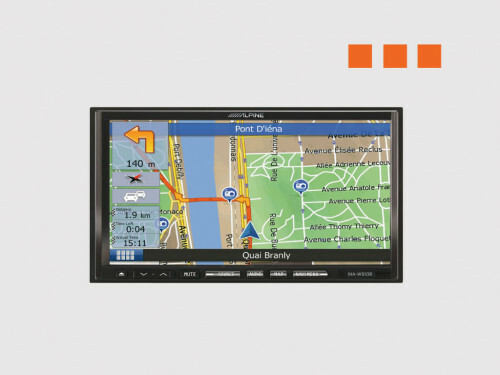 intelligent smart system for driver’s convenience.